"I had a dead leg one Sunday morning and it progressed to full paralysis within two hours," says Dr Denise Fitzgerald, from Queen's University Belfast. She was only 21 at the time, but the event helped to inspire the fledgling scientist to crack how the brain is repaired. The discovery reported today could potentially help millions of people with multiple sclerosis who have a rogue immune system attacking part of the brain. Dr Fitzgerald's paralysis was caused by a similar condition to multiple sclerosis called transverse myelitis. Part of her spinal cord had been stripped of a fatty substance called myelin - a protective coating that allows electrical signals to travel down nerves. It serves a similar function to insulation on an electrical cable. Without myelin, her brain could no longer control her body. The key difference between the two conditions is transverse myelitis is a one-off event, while multiple sclerosis is a life-long assault on myelin. Dr Fitzgerald's myelin slowly regenerated and was growing at about the same pace as the hair on your head. "I asked the doctor 'can you speed this up?' and they said 'not until some bright spark like you comes up with something'." She was, eventually, able to make a "95% recovery" and even taught herself to walk again through intensive physiotherapy. She told the BBC: "It shows how much regenerative capacity we have and on my mind was the repair process. "It was efficient and effective and that led me on to research on MS."
In multiple sclerosis, the immune system mistakes myelin for a hostile invader and launches an assault. It can either just get worse, known as primary progressive MS, or come in waves of disease and recovery, known as relapsing remitting MS.
"One of the reasons people have relapsing-remitting is because that natural repair process kicks in," Dr Fitzgerald told the BBC. 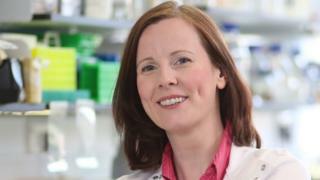 She is one part of a large research group made up of neuroscientists, immunologists and stem cell scientists that has cracked a key mechanism of how the myelin is regenerated. They hope harnessing this process could lead to new therapies. Their series of mouse experiments, published in Nature Neuroscience, has unpicked how the body restores myelin (it is a similar sequence of events that ultimately restored Dr Fitzgerald's movement). It starts with a type of white blood cell (called a T-regulatory cell) that is attracted to the damaged myelin in the brain. Once there it begins to co-ordinate the recovery like a foreman at a construction site. But rather than bark verbal instructions, the white blood cells do it chemically by using a protein with the technical name of CCN3. The protein then jolts nearby stem cells into activity. Stem cells have the rare ability to morph into other cell types and CCN3 tells them to become myelin-manufacturing cells. Dr Fitzgerald said: "From my perspective it is a fundamental step forward in understanding the biology of repair. "Our goal is to eventually use this knowledge to develop drugs to drive the repair of myelin and potentially this could lead to patients regaining function. "I love my career, but I'd happily be unemployed if the research field cures multiple sclerosis." It is still early days and the next stage of the research will be to perform experiments using human rather than mouse tissues. "If only I had asked to saved some my T-cells from my blood samples back then, when I was recovering function," she said while musing on a missed opportunity for an experiment. But even with treatments still on the horizon, the findings ask interesting questions about multiple sclerosis itself. Why does the repair process get worse with time? Does the disease become more severe and the repair process cannot keep up? Or does age make the repair less efficient? These will also be considered in the next stage of the research. Fellow researcher Dr Yvonne Dombrowski added: "This knowledge is essential to designing future treatments that tackle neurological diseases, such as MS, in a new way - repairing damage rather than only reducing attacks. "In the future, combining these approaches will deliver better outcomes for patients." Dr Sorrel Bickley, the head of biomedical research at the MS Society, said: "This exciting study gives us an important understanding of how myelin repair can be promoted, which could open up new areas for treatment development."